Movie stardom also came “overnight” once he was showcased in a lead role in 1935. Nelson himself scoffed at his acting ability, as did many critics. But none could scoff at his voice, charisma, or the genuine sincerity of this man who in “real life” had a tremendous capacity for love and compassion. This serious young man who dropped out of school at 14 to help support his divorced mother, was highly educated and throughout his life was always reading, learning and searching for philosophical truths. He had a longing and need to understand life and comprehend why it dealt him such difficult hands. That personal tragedies nearly brought him down several times is undeniable, that he was able to pull himself back up by his boot straps and carry on, and re-invent himself and find loyal and loving friends in his life is again, nothing short of miraculous. 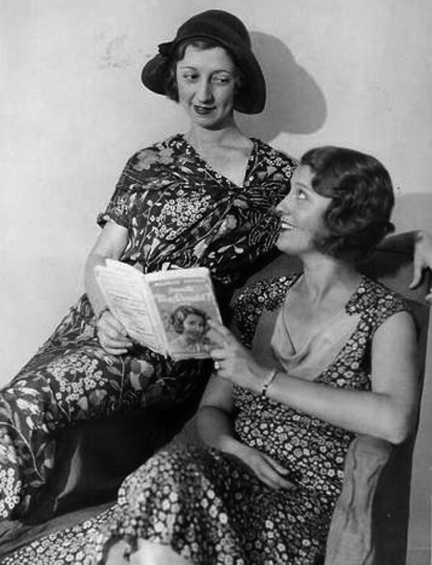 In recent months we have come to learn about and see the viscous comments, letters and documented actions of some people in Nelson’s sphere, particularly in the Jeanette MacDonald camp. In the years Jeanette was failing, those people did everything they could to negate Nelson, try to write him out of her life and make him feel unwanted. (Here’s an actual example that clearly makes the point…just mind boggling!) It is painful for me (and many of us) to learn these things this last year, how very stressful was it for Nelson to experience living in that hostile atmosphere and to have his help turned away by those who preferred to see Jeanette go down. One can easily understand why at times he had to simply walk away and create life and work and art and close friendships elsewhere. By nature, he was a man capable of youthful, lighthearted fun and joy, to see the positive side of life and live for the present and future. And yet, the sorrows of the past could drag him down into almost unspeakable pain. Whatever his emotions, they were easily read on his face and in his manner, that naked, boyish honesty that shone through when he was singing or acting onscreen. Did you ever read Longfellow’s poem “Footsteps of the Angels”? He recited every verse to me and it was indeed the footsteps of the angels to my soul. And here, fittingly, are the words of the Henry Wadsworth Longfellow poem written in 1839. Can you imagine Nelson Eddy reading this poem aloud and explaining and discussing its meaning as a comfort to the woman who had just lost his child? 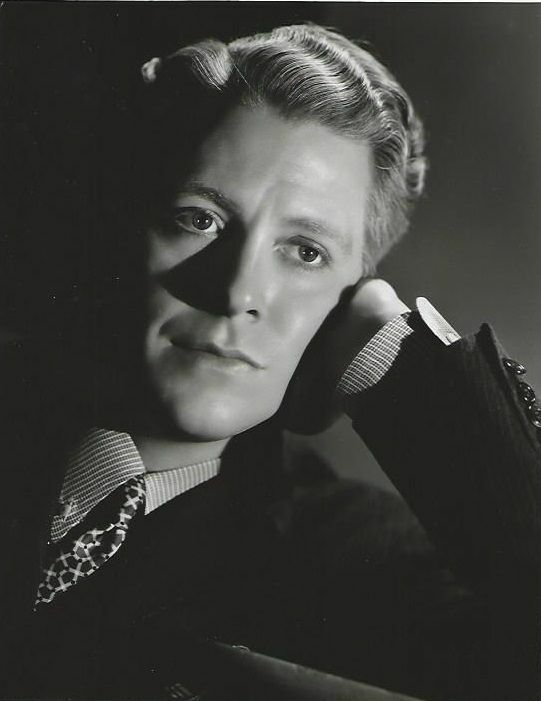 Nelson Eddy was a rare and unique man and we honor his memory today. Thanks to Maria Escano for the photo…and thanks to all who have helped us learn and understand more in this last year. I would sincerely encourage those of you interesting in learning more to attend either our Sturbridge, MA event or the Los Angeles one – or both. Our “Master Classes” continue because amazingly, the research and revelations continue as well. Hard to believe that he didn’t fully realize what was going down; after all, he and Jeanette generally spoke daily on the phone and he admitted to the press that they had talked just a few days earlier. 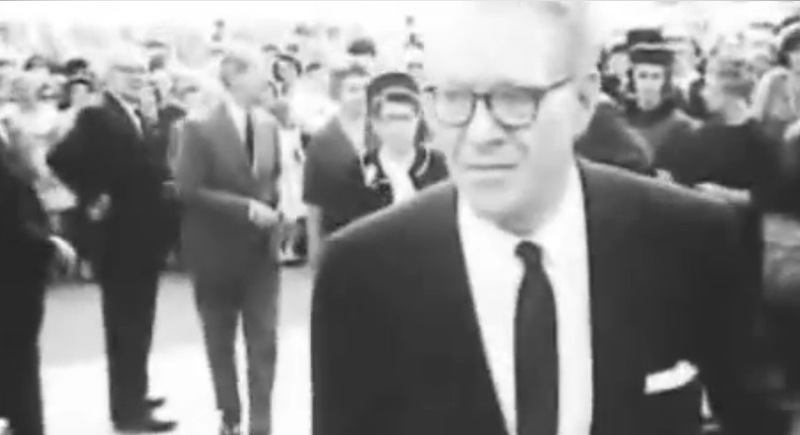 It’s not certain when the last date was that he saw her in person; certainly he accompanied her to the UCLA hospital when she was admitted just before Christmas 1964. Her private duty nurse verified that Nelson visited Jeanette during the hospital stay – although not on her shift. Once Jeanette was released from UCLA and the private duty nurse was let go by Gene Raymond (and replaced with no one) on January 4, 1965, there was a period of 8 days before Gene finally sprang into action, putting his dying wife on a COMMERCIAL plane to Houston, Texas. Her life was in such jeopardy at this point, it boggles the mind that he did not instead drive down Wilshire Blvd where they lived and take her right back to UCLA where at least they might have tried to stabilize her. And only then, since her husband was an Army Air Force pilot, perhaps Gene could have called on a friend to use a private plane instead if she had to be flown anywhere. There is the other issue of Jeanette’s phone being removed from her bedroom which the private duty nurse, Susan Nelson, verified…but of course the the logical thinking was that Jeanette was weak and having a phone added undue stress; according to Mrs. Nelson there was no phone in Jeanette’s hospital room for that very reason. Nelson complained when his phone calls were diverted to Gene’s apartment but his last phone call with Jeanette (made from the living room, not her bedroom) reassured him that she was doing okay and recuperating. The timing of Gene finally taking Jeanette to Houston cannot be a coincidence as all this went down while clueless Nelson was heading to Anaheim to open his nightclub act. What would have happened if Gene called Nelson instead and said, “Hey, old man, she’s in rough shape, can you come over and help?” If Gene wasn’t going to get a private plane to Houston, Nelson certainly could have quickly arranged it by calling a friend…he had connections everywhere. I think the reason Gene didn’t do this is obvious – for when the dust settled, Nelson would have understood what we now know to be true – the degree of neglect and abuse that went on under everyone’s nose. In the end, Nelson did learn some of these details and he turned in anger to Jeanette’s sister Blossom for not alerting him. But Blossom herself seemed to be somewhat clueless. She was busy working on her TV series and she expected her sister was being cared for by those whose job it was to do exactly that. In the years that I knew Blossom, she never expressed anger or lashed out against Gene Raymond regarding Jeanette’s final days…her only comment was finding a single can of soup in the cupboard but her assumption was – just like Nelson, that everything was being attended to with food made or brought in and Jeanette being carefully cared for and fed as best as she would eat. But even as a teenager, my learning about this for the first time and trying to ask Blossom non-accusatory questions regarding Jeanette’s last days was frankly difficult…Blossom did mention the topic of some arguments Jeanette obliquely referred to in her 1963 diary about the “same old thing”…namely, Gene’s efforts to convince Jeanette that Nelson no longer cared for her. For decades I have said little about this subject, not wanting to judge either Blossom or Nelson because I felt I had to be missing some of the facts. But the discovery of Jeanette’s desk diary put into perspective that yes, this is exactly how things went down to its sad ending. 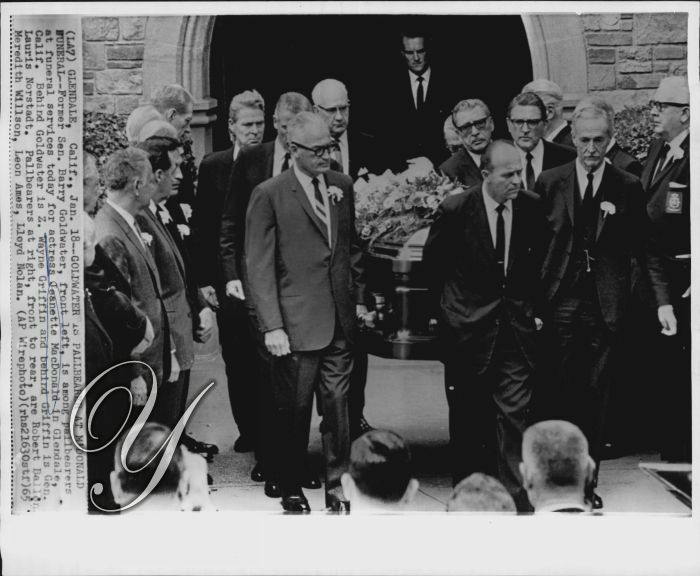 Below, Nelson standing on the left of the photo as Jeanette’s casket is carried out of the church. Note that all the honorary pallbearers are looking at the casket, Nelson is looking down. Why did Jeanette not complain to either her sister or Nelson? It seems she confided in no one as to certain challenges in her life. We have learned that to be sadly true this last year…in her 1963 desk diary where she writes about the abuse and neglect going on in the final years of her life – which started earlier than I even understood. This has been covered in detail but honestly, there’s no joy in “being right” about what happened. It’s frankly inconceivable…. Maybe Jeanette didn’t think anyone would believe the truth after all the years of cover-up, maybe she could not muster the strength to deal with an ugly scene which, after all, she brought upon herself and blamed herself for. Her weight fell at times to below 100 pounds and she was suffering constant dizzy spells, fainting, migraines, etc. as her heart was failing. I discuss in Sweethearts several “reasons” Jeanette gave for not wanting Nelson to see her as an aging sick woman. Getting old is no fun for anyone, having to scale back financially, being less able to work or do projects, having a body that fights your mind with its aches and pains, etc. But imagine what it’s like for someone who was once a great film star, idolized and on a pedestal to your public and to one certain man. When you have wielded such power, how hard is it to reach out for help in your low moments? Was she simply resigned to the way her life was, tolerating it as abuse victims are sometimes prone to do? He was one of Hollywood’s greatest actors, someone whose estate could have been worth hundreds of millions when he died in summer 2014. Instead, he endured beatings, humiliation and poverty at the hands of his eighth wife and one of her sons, both accused today of elder abuse and destroying a legend. Mickey Rooney shrieks in pain. Is he OK? “No, I’m not,” he says, choking back tears. It’s July 2010, inside The Grill on the Alley in Thousand Oaks, and in the midst of an interview with one of the authors of this piece, the diminutive 89-year-old has been kicked under the table by his eighth wife, Jan, as confirmed by his stepson, Chris Aber, who also is at the table. “She kicked him real hard,” says Chris with a laugh. Rooney’s offense? Rambling in his answers. This meeting took place because the interviewer (who, as a then-freelance writer, was gathering material for a book) agreed to requirements set forth by Jan and Chris and conveyed to him over the phone by Kevin Pawley, Rooney’s Kentucky-based manager: Bring a check for $200 and slip it to Chris when Rooney wasn’t paying attention (ostensibly because financial transactions made him uncomfortable) and treat the three of them to lunch at the restaurant (Jan later ordered dinners to go for each of them). A flip cam at the end of the table rolls as Jan, theatrically seeking the source of what caused her husband’s pain, peers under the table for a moment and then turns to Chris and scolds him for confirming, in part, what the general public only would learn later: In his final years, Rooney was the victim of ongoing elder abuse. The alleged wrongdoing and how it went on for so long has been a mystery — until now. Five years after that interview, and more than a year after the star’s death, an investigation by The Hollywood Reporter (uncovering legal documents, witness testimony and financial records that never before have been publicized) indicates Rooney’s life was more abusive than he let on while he was alive. My daughter Juliet and I went to see Mickey Rooney’s show during one of the last times he performed in New York state. He was still an entertainment powerhouse, a born vaudevillian who you sensed would die with his boots on. But I watched him carefully during a segment when the room went dark and some film footage was shown of him and Judy Garland as kids. He stood to the side leaning against a table; I ignored the movie footage and studied him. He looked very tired and frail and tried to catch his breath, he was gasping a bit. The footage of Judy brought tears to his eyes, he wept unabashed for a moment before wiping his eyes. My heart broke watching him, why did he have to be trotted out like this? Was this fun for him? Did he need the money that badly? Well yes, apparently he did. After the show, Juliet and I dutifully bought something so we could meet and greet him, then we stood to the side just to observe. The wife and the son in particular were running the whole show and Mickey was very meek and compliant and honestly, something seemed very off about the whole setup. Juliet and I finally left and discussed our fears about his health during the entire drive home. How much courage does it take for an older celebrity to reach out when help is needed? I have written before about attending Eleanor Powell’s birthday party, 1978 I think it was. To walk in and meet her and have her do a dance for her guests – just to show that she still could dance like a dream – was a thrill. She was as gracious as could be but the first thing I noticed was that her clothes and shoes seemed a bit worn. This was a red flag to me but I said nothing. I also had a few phone conversations with her and twice we had long talks – or rather, she did most of the talking – and I realized then that she must be a very lonely person. She hardly knew me, she loved to reminisce about Nelson Eddy and she clearly adored him as her eyes filled with tears while discussing him with me at her party. Other than the politics between fan clubs, I don’t remember exactly what she was chatting about on the long phone calls. Only that I sensed her life was not all rosy. When Peter Ford finally wrote a biography of his dad, Glenn Ford, only then did the facts come out that Eleanor suffered financial challenges in later years after her divorce from Ford and her life was difficult. I had observed something was not right and was saddened to learn that my observation was accurate. She was such a kind lady…no, it wasn’t fair. On that November evening in 1985 Philip lapsed into hepatic coma (liver failure) on my mother’s living room floor and died three days later in Van Nuys Hospital. He was deeply steeped in the disease of alcoholism…he was an ‘alcoholic’, a very very sick one. Our family was literally wracked- to- death by this and mental illness. As you know my poor mother had a very sick mother was also alcoholic AND mentally ill. Both of my mother’s sister were heavily afflicted by mental illness and alcoholism. The majority of their children are fated with this dilemma. My son is schizo-affective as well as alcoholic and my daughter is alcoholic. This is a family disease….and you’re right it is “truly a miracle” that I can even write this note to you. Michael Evans prided himself on being the only sane person in his family…but he admitted that even he struggled. He spoke at a club event in New York City and went into uncomfortably graphic details about what Susanna Foster endured during her childhood. And I questioned him separately about WHY Susanna and her two children lived sometimes in near-poverty in the years after her divorce from baritone Wilbur Evans. Why did Evans not realize that his children were at risk or that Susanna was not capable of taking care of herself or her children? Again – it was pride. I also asked Michael why he or his brother did not confide to their father the sufferings they endured in their childhood… but they were numb. They didn’t want to rock the boat and perhaps upset their dad or their precarious lifestyle. Michael was grateful that I understood the problems with his mother because some of her fans blamed him for not “helping” her when she refused all help. Eventually, though, he moved her to the East Coast where he lived and made sure she was safely taken care of in the Actors’ Home in New Jersey. When Susanna died I spent literally hours with Michael on the phone as he discussed the tragedy of his life and legacy. I’m sure there are many more stories of film stars or celebrities who kept quiet about suffering in their later years – when any fan off the street would have been more than happy to help them in any way they could. No wonder Jeanette leaned on her fans to the degree that she did, even in her declining days. 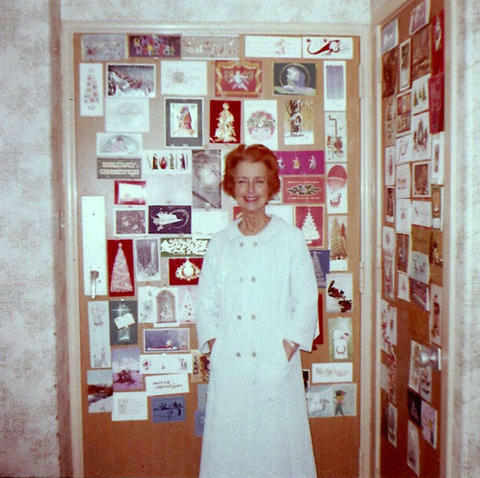 Below, Jeanette in her Houston hospital room about a year before her death. But did Emily bother to invite Nelson to said dinner? Never, of course not! Probably he would have declined anyway, preferring to spend time privately with Jeanette rather than having to play social friends with people who didn’t like him – excluding Blossom. That’s probably why he had his own apartment in the building right next door to Jeanette. (This did not become public knowledge until after Nelson’s death, when his widow eventually chose to move into it.) Or maybe Ann had made plans for him with her family. But that’s not the point. My God, the man had been a fixture in Jeanette’s life for over 30 years. And yet to the bitter end, they only had stolen moments together. And lived with constant disapproval around them, whether voiced loudly or not at all. Does Emily mention that Nelson was the upset, traumatized one who went to the hospital with Jeanette, that Nelson was even on the scene? Nope – that’s all conveniently rewritten out of history! 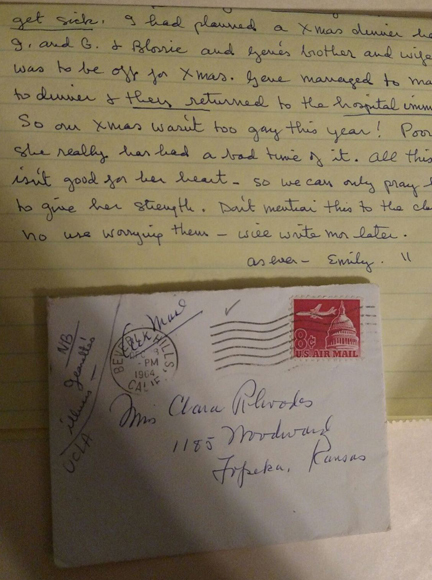 Instead, Emily is quick to point out that on Christmas Gene “managed to make it to dinner and THEN (underlined) returned to the HOSPITAL IMMEDIATELY (underlined). “So our Xmas wasn’t too gay this year!” writes Emily. And Gene Raymond comes off looking like the very devoted husband diligently putting his wife first. “As ever – Emily” she signs this letter and yes, it was as ever, always spinning the correct PR. For some reason, it seems far more painful this year to contemplate the events leading up to Jeanette’s funeral on January 18. The rejection and pain that Nelson endured – on so many levels – must have been devastating. Here is further reading about Nelson’s reaction to Jeanette’s death, funeral footage and a telling photo of Nelson one month later. But…better to end on a high note and remember them in their youth…when the world first discovered this magical team. Mr. Eddy had as his guests 100 soldiers from the hospital. They requested him to sing “Danny Boy” and he said that as he didn’t know the words very well he would sing it with different words, “My Love of Londonderry” and we could just imagine he was singing the other ones. It’s highly unlikely that Nelson Eddy “didn’t know the words very well.” Granted, this song has been sung with different lyrics over the decades but certainly Nelson was quite familiar with it. What stands out is that after singing “Danny Boy” in September 1936 and September 1937, Nelson did not sing the sing the song the following autumn – of 1938. 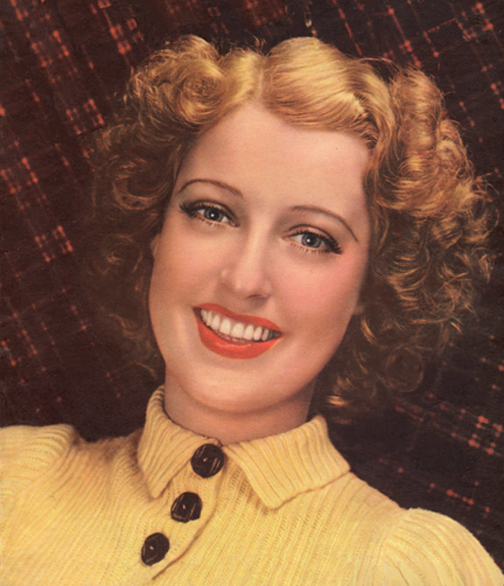 I’m sure some of you are a few steps ahead of me here… aware that in 1938 Jeanette MacDonald came the closest she would ever come to having a baby with Nelson Eddy…a too-premature boy that did not live but that they named Daniel, in honor of her deceased father. This is the version that Nelson chose to sing when not wanting to do the standard “Danny Boy” lyrics. He’s referring to the blue-eyed girl that he loves. This cannot be coincidental because in 1937 he was facing making a new film with Jeanette after her marriage to Gene Raymond…and he wasn’t doing a very good job of pretending he was over her. And as for October 22, 1939, Nelson was again trying desperately to make peace with Jeanette so they could work together in New Moon. These were highly personal lyrics, proclaiming his love for her. Did it soften her up? Remember also that Nelson told Jeanette to sing “One Kiss” just for him, writing her that “my love for you is indestructible.” So what did Jeanette do? She sang “One Kiss” on a radio show exactly one week later, October 29, 1939. In September of 1940 Nelson sang it again – on a show called “We Think of England.” Not his normal radio show. And then he skipped 1941. Then sang “My Love of Londonderry” at this April 1942 concert and and less than a month later the same melody on the radio again – but instead with the original “Danny Boy” lyrics (we have the show here to verify). Truly this was a sad song for Nelson after 1938 with the “Danny Boy” lyrics…but when requested to sing it by an audience of WWII servicemen, he sang the more personal lyrics instead about a beautiful girl with sweet blue eyes…and “the love that never dies.” Though even with that version, the fan writing about Nelson’s concert in April 1942 noted how subdued he was. Actually, folks, there WAS a reason that Nelson chose not to sing “Danny Boy” that evening and it had everything to do with what was happening in his life and in Jeanette’s at that time. But that is another story. The audience accepted the excuse he gave. The Liberty Hall – where the concert was held – was 7 blocks from “our” hotel…. I rushed [to get back to the hotel] for it was blowing and raining…. When I got there I sat on the big majestic chair which was near the elevators – a tall, straight backed carved Spanish affair. In about two minutes a party came marching in the front doors, a pair of broad shoulders being the most dominant element…How different he looked from that concert apparition! Maybe it was that big grey overcoat, but he looked rather huge, very tired and quiet. Note: Nelson did write the lyrics to a new song about Jeanette; the 70th anniversary of his singing “My Wonder One” on the radio is explored here. Today we celebrate Jeanette’s life…and also remember and honor her older sister Blossom Rock (aka Marie Blake, pictured below) who, ironically enough, also died on this day exactly thirteen years after Jeanette on January 14, 1978. By the way, you can listen to Nelson’s radio rendition of this song at this link: http://www.youtube.com/watch?v=npqMilMRCkk. Note that the video says 1938 but once it starts playing the correct date is flashed on the screen, it’s the 1937 version that Nelson sang on September 19, 1937. Thanks to Kitty Job for spotting this and providing the correct link.